Referencing the evangelical prompt “WWJD?,” this limited-edition artwork by Los Angeles–based artist Dave Muller depicts Sun Ra—the prolific jazz composer and father of Afrofuturism—floating among blue stars with an emanating sun in the place of his heart. Keeping with Muller’s technique of enlarging music paraphernalia to magnify its cultural importance, the work is produced as an oversized vinyl sticker that can be applied to any surface. 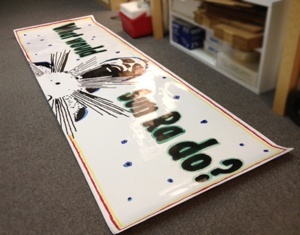 Printed on adhesive gloss vinyl with a paper backing. Made to order. Please allow 2-3 weeks for production and shipping. Each print includes a certificate of authenticity signed by the artist. Questions? Contact us at store@eastofborneo.org.